I found a picture with a quote on facebook today quoting Einstein. When we first got married, we made a pact. It was this:In our life together, it was decided I would make all of the big decisions and my wife would make all of the little decisions. For fifty years, we have held true to that agreement. I believe that is the reason for the success in our marriage. However, the strange thing is that in fifty years, there hasn't been one big decision. The first marriage was to Mileva Marić, from January 1903 until their divorce on 14 February 1919 - i.e. 16 years of marriage. The second marriage was to Elsa Löwenthal on 2 June 1919 until her death in December 1936 - i.e. 17 years of marriage. He never had a 50th wedding anniversary, and he never had an opportunity to say "in fifty years, there hasn't been one big decision." This doesn't prove the quote isn't a distorted version of something he did say. A successful film is one on which most of the decisions have been correct; an unsuccessful film is the opposite. It comes down to the question: Who makes the decisions? Kanin was reattributing a pre-existing joke to Einstein. Harry said "Look there is nothing to it. When we got married, we made a pact. We agreed she would make the small decisions and I would make the big decisions. We never violated that agreement. As a result, we have never had a cross word with one another for twenty years and we are going to go along for twenty more on the same basis." Joe said, "That is fine. What is the difference, where do you draw the line? You say Mary makes the small decisions. What does she decide?" Joe said, "If those are the small things, what do you do?" He said, "Oh, I make the big decisions, should we recognize Red China? What are we going to do about Nasser?" "When Gwen and I got married," Donald says thoughtfully "we decided who was boss right away. We agreed that all big decisions were mine. All little decisions were hers. Of course," he adds, "we haven't made any really big decisions". One husband after a year of marriage reported to a masculine friend, "We decided that she would make the little decisions and I would make the big ones, and we are getting along fine; no big decisions have come up so far." We have a similar agreement in the Rogers family. When Mrs. Rogers and I were married, she said, "Now Jack, I'm going to take care of the major decisions and you take care of the minor decisions.” So far there have been no major decisions to make. I see to that. It's more or less impossible to prove the negative, but unless someone can find the actual quote, I'm going to say No. Per Wikipedia, his first marriage ended in divorce after sixteen years, and his second marriage ended with him a widower after seventeen years. 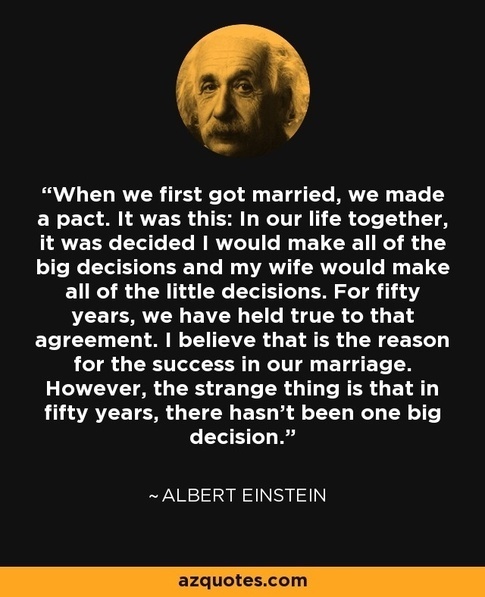 Neither one is a candidate for a successful marriage of anywhere near fifty years — even if he could have called his first marriage successful for the first fifteen years, and his second for the full seventeen, that's a total of thirty-two years, which I doubt he would have combined and rounded up to fifty, then attributed to that agreement. On the other hand, he did make a few glib comments which were not intended to be taken literally (the thing about compound interest, the one about sitting on a hot stove, etc.). For example, W. Isaacson's biography, which is very well documented and covers a lot of his personal life, doesn't cite anything like that at all. Also, he had 2 marriages, each of less than 20 years of length (as cited by the other answers). Elsa spent most of her marriage with Albert acting as gatekeeper, protecting him from unwelcome visitors and charlatans. She also was the driving force behind building their summer house in 1929. Note that this second biography seems much less reliable as it contains "shock claims" in its sleeve ("This controversial account of Albert Einstein's scandalous personal life challenges the image of this genius, painting a shocking portrait that exposes him as "an adulterous, egomaniacal misogynist who may have even beaten his first wife"").